When you’ve been out of the music scene for more than a decade, how should your comeback album sound like? Musically similar to the type of songs popular when you left, or genre-wise what is current? 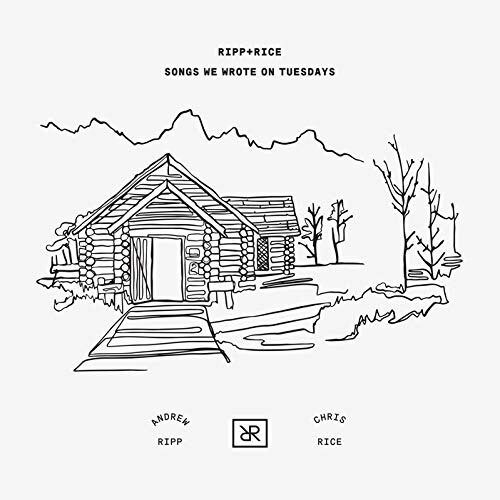 Therein lies the issue of Chris Rice’s comeback- a project with Andrew Ripp under the moniker RIPP + RICE. Songs We Wrote On Tuesdays released around a month ago, and for fans of Chris Rice, and his smash hit songs such as “The Other Side Of The Radio”, “When Did You Fall”, “Bigger Than”, “Nothin’”, “Deep Enough To Dream”, “Go Light Your World” and “Come To Jesus”; you’ll find that Chris is more reserved here, as he sings about love, death, faith and everything else in between. Andrew is probably the lesser known of the two artists (I’m actually not aware of Ripp’s music, period!) and thus I reckon for lovers of CCM, you’ll find around half the album very, very different from what is normally played on the radio. Yet there’s still something about Chris and Andrew’s collaboration, that makes this 13-track project all the more enthralling and compelling. Maybe we all should treat this album as a ‘debut’ project of sorts. But whatever the case, Chris and Andrew have poured their heart about- and no doubt this release is sure to worm its way into the hearts and minds of many listeners- even though not a fan of country and southern gospel, which is what the bulk of this record is. “Via Dolorosa” opens the musically unique album, as Chris leads the reflective guitar led ballad, and earnestly asks God to be with him during times of trial and adversity, passionately crying out ‘…via dolorosa, lead me on the painful way, and meet me there when it’s over, when darkness turns to day…’; while Andrew’s first offering in his half of the album is “Not So Far Away”, a stirring acoustic guitar country-inspired ballad that delves into the longing between a man and a woman not yet in a relationship, or even in a long distance relationship- as he ardently relays to us that perhaps a relationship isn’t that far away. Andrew may be talking about himself or a friend he knows, but it is this song nonetheless that gives people hope that you can have good things in your life despite other people’s opinions of you, or even your opinion about yourself. The rest of the album follows in a similar vein to the aforementioned two album ‘openers’, with Chris singing the odd songs and Andrew the even songs. There are no duets on the project- and that is a shame and a sad reality, however both Chris and Andrew individually reveal to us the fact that an album with two artists can work, provided that the themes are similar and the flow is right- which is mostly is. “This Ain’t No Love Song”, led by Chris, is in fact a love song where Chris describes his wife as being an angel; while Andrew enters into another faith inspired melody in “Let It Burn”, a synth and keys led ballad about surrendering our worries and our fears to God- letting everything burn and letting God take care of the future. Andrew also leads “Hold On”, and Chris takes the reins on “Nothin’ Like This”, as both piano led slow-tempo ballads speak about holding on to the promise that the day will be better than it is right now (“Hold On”), and about the notion that we can never really nor fully experience anything like what we feel with our spouse or life partner (“Nothin’ Like This”). While worship is also represented here with Chris’s “Gorgeous”, as we are presented with a vivid description of heaven, and a hope that we as humans can be gorgeous for Jesus, so that He can be pleased with His creation. By the time the front end of the album ends, we realise that Songs We Wrote On Tuesdays doesn’t have that much structure than originally thought. The songs are fine, however they drift from love song to hopeful mainstream song to worship song and back again- and at times it feels a tad all over the place. But the passion from Chris and Andrew still seeps through, and that makes this album nonetheless impacting and well worth the listen. “Gloria”, probably the only misstep in the album, features Andrew singing about a relationship in the verses- and then a refrain of ‘gloria’ in the chorus, without any context. Apart from that though, the album continues in emotional and honest fashion, with the hopeful “Carry On” featuring Chris encouraging a young girl to keep on using her talents for the greater good of the world- encouraging her to carry on and do what she does, even if people tell her that they know better. Subtly this could be her sharing the gospel, but the beauty of the ambiguity here means that people from all walks of life can relate to this track. “Boy” (Andrew doing his best impression of One Republic, as he questions the chaos of the world while also longing to go back to when life was simpler and children had more innocence), “Took Your Breath Away” (A piano ballad with Chris singing in wide-eyed wonder about the notion of his grandparent’s faithfulness and dedication throughout the years), and “Frontlines” (a short but impacting promise from Andrew, about how he will do whatever it takes to love his wife the way she should be loved) follow- and all are sung quite beautifully, honestly and emotionally; while the album closer “See You There” is led by heartfelt keys, and is a tearful goodbye between friends and/or family, as Chris reassures us all that if we don’t meet each other again in this life, we will in heaven. A little bit disjointed in that the subject matter is all over the place, RIPP + RICE’s ‘debut’ project works purely on the strength on the duo as songwriters and as singers. Might we be seeing more albums from these two in the future, or is this just a one-off? Is Chris Rice permanently coming back to music? I guess these questions will keep on being asked yet Songs We Wrote On Tuesdays should be enjoyed in its own right. There’s heaps of lyrical gems here, and maybe a second or third listen would be ideal to fully grasp all of the concepts. Chris and Andrew have recorded a project dear and near to their hearts- and here’s hoping that this is the start of a beautiful and fruitful partnership and re-entry for Chris into music. For now though, 2019 is looking good with this collection of 13 emotional and personal tunes- and here’s hoping that whatever’s next will be equally as compelling.